Tezuka Osamu (November 3, 1928 – February 9, 1989) has been the most celebrated cartoonist of the Shōwa era. He produced an unparalled number of remarkable works, contributing to give shape to what we commonly refer today as the “story manga”: Tetsuwan Atomu – literally “Mighty Atom” – known in English as Astro Boy, Janguru Taitei (Kimba the White Lion), Ribon no Kishi (Princess Knight), Black Jack, Hi no Tori (Phoenix) and many others, which had a huge impact on the child readers during the Showa era. This goes especially for Atom. Without Atom’s conception, we wouldn’t probably have had such a flourishing of animation and manga culture, as well as that confidence on science’s application, technology, of which we are witnessing such a development in the field of robotics today. 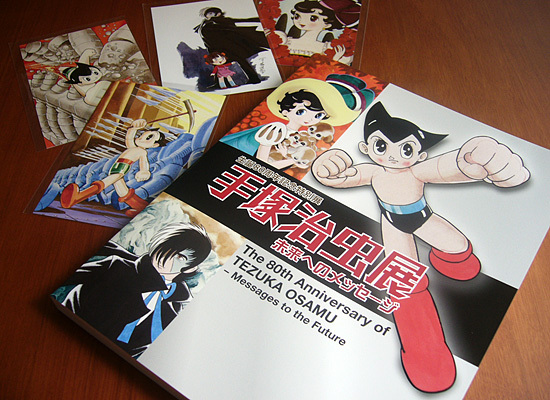 The exhibition, titled ‘Messages to the Future’, was a memorial of the 80th anniversary of Tezuka’s birth. It was very nice and I thought it was worth watching. 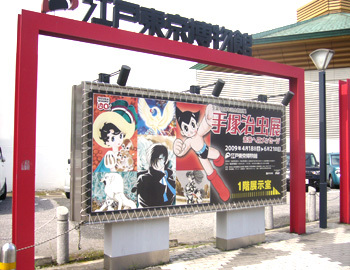 It showed original artwork taken from Tezuka’s manga works, including some draft drawings, presented in chronological order. Left: The Edo Tokyo Museum is located in Sumida Ward, Tokyo, nearby the Ryogoku Kokugikan Hall, a famous site in the Sumo wrestling field. The museum has a huge diorama built around the theme of the downtown urban life in the Edo period, around 300 years ago. It’s a fascinating way to get acquainted with the old Japanese citizens’ lives and customs. Right: A billboard of the Museum. 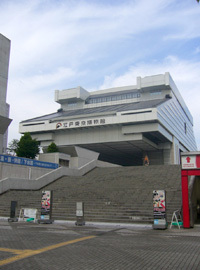 The building in the background is the Ryogoku Kokugikan Hall. The opening part of the exhibition features the insects’ sketches done by Tezuka in his childhood. His name Osamu 治虫 was taken from those insects, called ‘osamushi’ (in Japanese it means ‘Ground beetle’). He really loved to watch insects. Even the small sketches in his pocket notebook show the insects’ body depicted in a very detailed way. Later on, he added captions to all of the pictures and compiled them into a book. The exhibition represented a rare chance to see his early works while he was a college student. The characters in the early works were very cute. I was not familiar with them but I was surprised to see how they looked to me like ‘prototypes’ of his later, more famous, characters. It did not just show his more famous works, such as Atom and Janguru Taitei, but many later works I was not familiar with, and unfinished material as well. On various artwork panels it may be seen the white-outs painted to conceal mistakes and spots, and the lettering was often added later on, done on separate pieces of paper and sticked on them. By looking at the surface of the drawing paper, I felt like I could almost see how he drew the lines and refine them with the black ink. The ink was really vivid and the balance between black and white was always achieved with very beautiful results. This reminded me of the balance between forms and counters of the letter we seek in type design. Tezuka’s mastery was not just about in his figurative drawings, but also in lettering, for which he had a fabulous talent. His vibrant title logos on the colored covers reached my imagination and enriched the story’s world. Of course, all of them were made by hand, without any computer aid. Angular logos were dynamic and powerful, they often seemed to express certain features of Atom and Janguru Taitei, of the characters themselves. Another part depicted Tezuka’s own daily life, showing familiar everyday objects such as pens, ink, erasers, glasses and his coppola cap (widely known as his iconic trade mark), all of them showcased on the desk where he used to draw, and there were photos with his family and the related manga works. The exhibition chronicled also the history of his many residences and relocations. I know that the Tokiwa-sou apartment was in Toshima Ward, which is nearby my town. But, I was surprised to know that the Mushi Production office is very close to my home. It seems it’s just within five minutes by bike! My town, Nerima Ward, is known as a manga town because many cartoonists live in here, but I’d never have told Mushi Production was located so close to my home. I think that the generation of japanese people most familiar with Tezuka’s works should be now at least in its 40s, or older. I used to watch Tezuka’s anime such as “Janguru Taitei Reo”, “Fushigi na Merumo-chan” or “Ribon no Kishi”, but all of them were re-broadcasted as replicas in my childhood. Unfortunately, I have hardly seen Tetsuwan Atom, because the series was old and black-and-white, and rarely reprogrammed. My generation (people which are now in their 30s) preferred to watch robot anime such as Gundam or Macross instead. Coming to manga, I loved to read Doraemon and Toriyama Akira’s manga, Dr. Slump and Dragonball. They were a huge success for children in those days. However, Tezuka’s manga had a great influence on me. They taught me a lot of things which I couldn’t get in school. For example, although its visual language may be a little strong, Fushigina Merumo-chan featured sexual education notions, while Black Jack gave me a strong sense of professional duty, humanity and compassion. As a child, I got interested in Black Jack because I’d sometime got sick and was forced to stay in hospital. My illness was not so serious but these stories encouraged me a lot. Of course I’m fine now. The catalog and post cards that I bought at the museum shop. Tezuka’s work represented a tremendous influence on the following generations of cartoonists. This means that I have read a lot of the manga which were influenced, directly or indirectly, by the work of Tezuka. I guess the influence continues to be carried on today, to the latest cartoonist, and flourished as animation and manga culture, which can now be enjoyed by many people across the world. He left a thousand of ‘Messages to the Future’ through his works. I would say Tezuka Osamu must be regarded as the father of manga. Revised on July 19, 2009.